One of the earliest obtainable maps or plans of New Orleans, Louisiana. 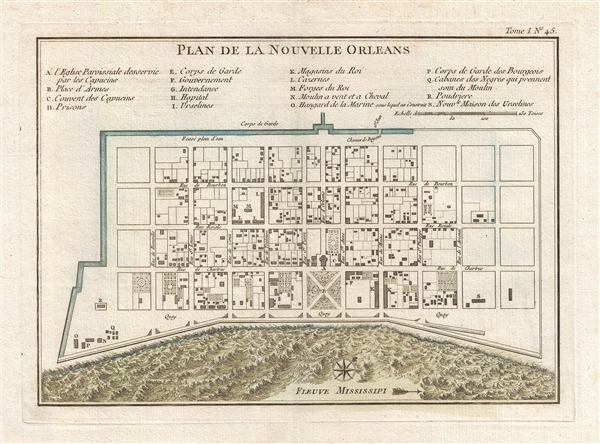 Plan de la Nouvelle Orleans. This scarce 1764 map by J. N. Bellin is one of the earliest obtainable maps of New Orleans, Louisiana. Oriented to the east, Bellin's map covers the original settlement of New Orleans along the Mississippi River and inland as far the Fosse plein d'eau (roughly translated: 'Pit full of Water') near modern day Dauphine Street, and from modern day Iberville Street (shown but not named) to modern day Barracks Street (shown but not named). The map shows some 100 buildings with some 18 specifically identified via an alphabetically coded table set just above the map. Among the locations noted in the key is one that provides an eerie echo of the slave trade. Item Q is identified as Cabanes des Negroes qui prennent soin Moulin or 'Cabins of Negros that care for mill.' Note how these cabins, as well as the adjacent mill, are both well outside the ordered structure of the city as well as conveniently located near the Corps de Garde des Bourgeois. There are several editions of this map. The present example, while not the earliest, is perhaps the most beautiful due to the addition of finely engraved turbulent waves to represent the water. Bellin originally issued this map in 1744 to illustrate Pierre François Xavier de Charlevoix's Histoire et description generale de la Nouvelle France. Later editions, most with slight modifications, were issued to accompany Provost's Histoire des Voyages, reissues of Charlevoix, and in this case Bellin's 1764 Petit Atlas Maritime. Bellin, J. N., Petite Atlas Maritime, Vol. 1, (Paris) 1764. Very good. Wide margins. Thick stock. Original centerfold exhibits minor wear. Blank on verso. Platemark.